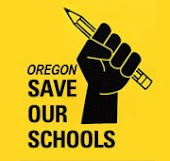 We at Oregon SOS are against the use of high-stakes testing in our public schools. High-stakes testing is different than a test teacher may create and give to students to assess learning because the results do not affect a student's grade or learning from a unit taught, but instead are very broad in questions and concepts can easily be missed. In Oregon (and many other states who received a NCLB Waiver) standardized, high-stakes tests are used to determine if a school is a "model" or "priority" school or not. Schools get labeled in Oregon and then the state wants to create more bureaucracy to manage that. These tests only serve the state and federal government in determining if a school is successful by their parameters or not--and under the Oregon plan, funding will go to the more successful schools while "failing" public schools can be taken over by private entities. Moreover, the state then has to spend an extreme amount of money to collect, manage, control and analyze all this data. It is typically a one-time test for the year, yet so much value is placed on it when deciding student success. Many families are starting to Opt their children out of such testing as they feel it does more harm that good. In conclusion, we feel such a testing system takes away valuable resources away from the classroom, narrows the curriculum that is taught to our students, and supports an unfair and unreliable way to judge students, teachers, and schools; and it doesn't respect our teachers' professional judgement to assess students. We believe there are many other valuable ways to authentically assess students that can be used to evaluate students. Below are articles that give good testimonials and information about why we feel high-stakes testing is detrimental to our public schools. We will continue to add more as needed. Have a question about high-stakes testing? Please contact us and we will be happy to discuss. Fantastic video testimony from Rep. Lew Frederick, teachers, and students about HB 2664---Evaluating the effects of high-stakes testing. "Pencils Down!" A great list of links that support why high-stakes testing is wrong. "High Stakes Assessments in Reading" by the International Reading Association, July 1999. "The Trend in Education is Away from Standardized Testing"
I have been following the Oregon education story for years. I am so impressed at what your community has been able to accomplish. I was once a teacher in Atlanta, GA. I taught only one year after receiving my MAT from the University of Southern California. The pressure of the standardized test was too much for me. I DREADED going to work pressuring my students to get ready for a test. It went against my spirit everyday. I wanted to know if I could have a brief moment of your time. I am in the process of organizing a group the bring the effects of standardized test to the table in GA. I would love to talk to you in your spare time. We can skype, google hangout, or talk on the phone. I wanted to talk to you about the grassroot efforts and strategies put in place by the community to take on such a massive project.